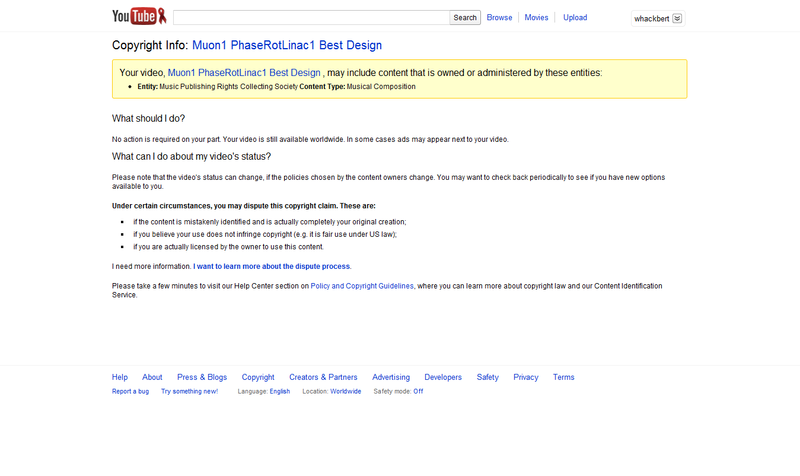 Rogue Websites don’t Obey DMCA notices, is the claim we’re seeing now about the new SOPA and Protect-IP laws. Yet there’s a flipside, as the penalties – CRIMINAL PENALTIES - for filing a false notice are ignored. Who watches those that watch for copyright infringement? For a while now, I’ve been involved with the Muon1 project. Some of you may have seen the videos, which show parts of a particle accelerator. One of my projects over the past few months has been to go through the sub-projects (called Lattices) and recreating the best designs. Since the program is silent, I add in a soundtrack, usually an “ambient” track from Jamendo. The reason I use Jamendo sourced music is simple. The music is CC-licensed, and available to download, which makes it simple to make the videos, while staying legal and giving some potential exposure to an artist. However, these artists are not without their enemies. The growth of direct-to-consumer marketing methods, such as Jamendo, has caused a backlash in the music world. Artists are less likely to seek the work of middleman publishers, which puts such people increasingly out of work. One way they can fix that is to use their contacts and their experience in the industry to inconvenience people. Since they’re already representing several artists, they have pre-existing communications with certain companies and entities. That includes companies like Google, where they have the knowledge and ability to claim videos and make copyright enforcements. That can lead to problems. In 2009, singer Edwyn Collins was unable to share his track ‘girl like you’ on Myspace. He owns the copyright but according to the database that Myspace uses, the copyright belonged to Warner, and they were the controller of it. That’s because Myspace uses a private database, provided by companies like Audible Magic. These databases make it really easy to steal copyright, and I do ACTUALLY mean ‘steal’, as in ‘takes it away from the owner’. Most of the time when you hear copyright theft, you are actually hearing about infringement, which is a completely different thing. In order for it to be copyright theft, you have to steal my copyright. If you are just violating that right, that’s different. There are even US Supreme Court rulings on this, so it’s not some debatable nuance of law. So, people are making claims of copyright where it’s not applicable. Now, what’s interesting is that under the DMCA, claims are required to have with them, an assertion that they are acting with the permission of the copyright holder to enforce this copyright, and they do so under penalty of perjury. Perjury is a criminal action, for lying under oath. Just to give you an example of its severity, President Bill Clinton was impeached for perjury. The thing is, there’s been NO enforcement of this perjury clause in the 13 years of the DMCA. The nearest there has been to any enforcement has been in the case Lenz v. Universal. However, that case is still ongoing, and no penalties for perjurous copyright takedown notices have yet been decided. Ok, you ask, but where’s this heading? The explosion of automated systems to ‘detect’ copyrights is growing. 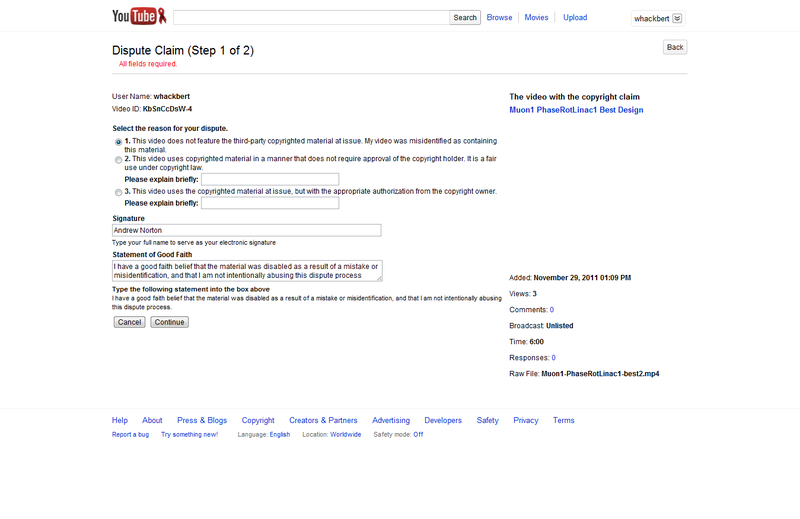 Claims are being filed against anything, and claims are being made BY anyone. Just last week, I uploaded a video containing some music for the Muon1 project. It’s embedded here. So let’s recap what was written earlier. 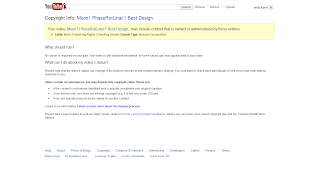 The music in question was from Jamendo, and was listed on the site as being under a CC-BY-NC-SA license. I was abiding by that license, so felt there was no problem. 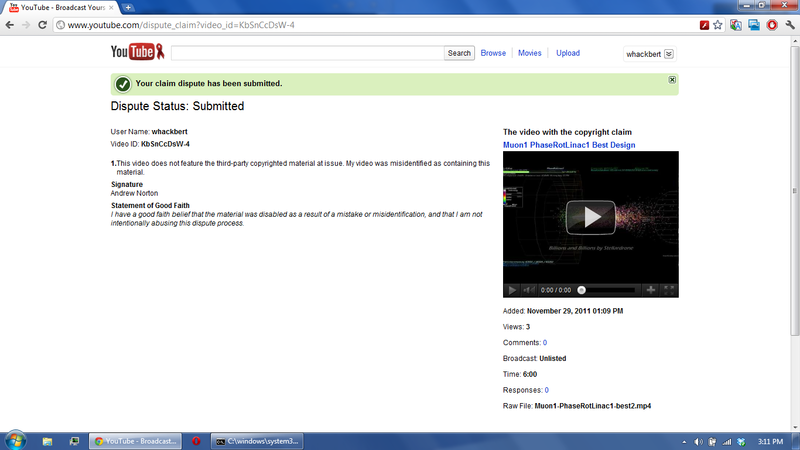 However, I got a copyright claim on it from a group. 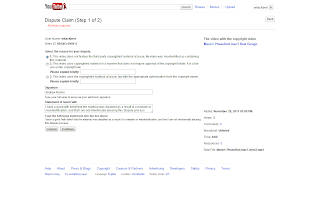 Here’s the youtube grabs showing the claim. The claim, as you see, is made by ‘Music Publishing Rights Collecting Society’ ,a name that actually means nothing. Some believe that it’s a collective name for any number of collections agencies, which exist to siphon wealth under the guise of giving money to artists. The major issue with them is they’ll claim rights no matter what, and try to collect money for artists that are not their members, or even for imaginary songs. Regardless, I wanted to make very sure of the issues, so I did what anyone would do when trying to find out the truth, I contacted the artist. Maybe he was signed up to a rights society, and there was some miscommunication. I appreciate your message very much, I am always interested in other people's works using my tracks, so.. thank you a lot. So far I released all my music under Creative Commons BY-NC-ND license. And that's only because I wanted people to know, that I do not require any payment or anything. But lately I decided to switch to Attribution only, because it is the only license that is the most consistent with my philosophical views on this issue. As you experienced yourself, it doesn't matter what the author is claiming, there will always be groups of people like "Music Publishing Rights Collecting Society" who will harass anyone just because they can (I am pretty much sure they have government support, otherwise you could ignore them, like spam). Well, there is also another thing: in my video of "Billions And Billions" I used video footage from Carl Sagan's "Cosmos", and after the upload I got the notice from YouTube that it "may include the content that is owned by Koch Entertainment". However, they didn't take the video down. Good for me. So anyway, just to be clear: all my music is free (under Creative Commons license, doesn't matter whether BY-NC-ND or just BY) and I have never signed nor thinking of signing any contract that could violate the freedom of use of my own digital content. Once again, thank you, and feel free to do anything with my music. So, I've done the only thing I can do, and file a counter-notice. We will see if anything more comes of it, but the music claim was clearly false. But groups like "Music Publishing Rights Collecting Society" will, as Edgaras says, always be around until penalties for false claims are even in the same ballpark as the penalties for infringement. If there are any further developments, y'all will hear of it. Amazing. Talk about "vested interests". Paper/journal publishers and software/games publishers are also on the list of species endangered by the internet, but even they don't try this sort of crap. Though I did go to a conference once where I had to sign the copyright of my paper to the American Physical Society! (It's still on my website for free and they haven't come chasing me over it).